This riddle has NO NAME! But people tend to call it MOLE or THE MOLE because of many mole pictures and(or) clues referring to moles. It first appeared on 4Chan where a post led to the Reddit post of Nakano-Anapa, just as linked in the description. It's a highly cryptic riddle so sometimes it involves code breaking, information research and stenography. The intention of the creator or the meaning/use of this riddle are unknown yet. This will seperate the capable users from the unnecessary ones. The first riddle you have to solve will introduce you to Jhon Titor. Find out what he did and where he appeared. Pay attention to Mel Reckling's first reply, check the letters. Maybe you will find the way. DO NOT FORGET ABOUT THE FUTURE. John Titor was the nickname of a person who claimed to be a time traveler from 2032 who appeared on the Artbell forums back in 2001. This clue was all about research. The next clue was in Mel Reckling's reply on John Titor's post at the end of page 2. Nakano-Anapa's message of the previous clue was the key for solving the puzzle. By taking all the capital letters together and adding a ".jimdofree.com" a website was found. The website was password protected. The password clue is the "what was he searching for?" text from the previous website. The answer was IBM5100 as John Titor was searching for this computer. The site was a forum, where supposedly the PM posted several clues. The first post was: http://3htz4556hfz.boards.net/thread/3/comment. Nothing important was found there. The txt contained an Enigma encoded text. The pattern started from the middle of the text and started as: "1(letter) down, 2up, 3down, 4up, 5down, 6up...and so on but it's important to know that when the pattern reached the top it still counted up, just by ending at the top and counting the rest of number from the bottom up. The site had a similar puzzle to the previous one. Using the "remeber fzzerfzquwnn1834662j" clue, the secure-area was unlocked. TIME, TIME ALWAYS SHOWS US THE TRUTH. We finished our primary test. Now the hunt continues in the real world. Seek for the moles. Soon they will appear on the surface. As a little present I will tell you my name. Text: somewhere on the planet. The solvers assumed that there might be something in the real world that they had to find. A common theory was "QR CODES". After several weeks nothing was found and the solvers tried if someone posted something on social media. A solver found a Chinese twitter account who posted a strange looking "QR CODE". This tweet can be found [https://twitter.com/1R77vN3yF2Qj3Sz/status/1024159737406009344 here]. That means as much as: I found this nearby ''Whampoa station''. As well if selecting the screen with your cursor a message and a link reveals in black letters hidden inside the black background of the picture. The devil will show you the way as well as this link: https://filehost.net/file_password.html?file=6fadfd5cf1740233. The password for the file hoster was unknown yet. This time the riddle got really hard. To find the answer the solvers had to check the picture itself. By raising the brightness and the contrast several hidden messages inside the picture got revealed on the black background. But the solution was deeper, to get the solution the solvers had to inspect the "red letters" of the picture. 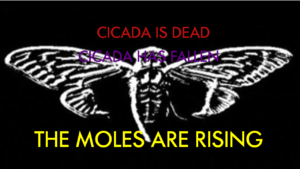 "CICADA IS DEAD". In the red letters there were Roman numbers hidden, but the only necessary ones were hidden in the "second A" of the word "cicada". VI VI VI which means as much as 666 what indicates the devil, just as the message on the website "the devil will show you the way". writing this color code together without spaces proved as the correct password for the file hoster. The order of the numbers is: 4 8 15 16 23 42. These are the numbers from the [ https://en.wikipedia.org/wiki/Lost_(TV_series) LOST] series. First the solvers thought that the numbers might be somehow a clue but there was nothing found. But by watching the video closely the it was possible to see the person doing strange hand signs with his right hand. A flat hand and a fist. The solution to this clue was "EXTREMELY" hard to find. Every detail of the video was necessary for this clue. Something that was very easy to oversee was the amount of folds each time he unfolded the paper. The solution was achieved by multiplying(fist) and dividing(flat hand) the codes of the T-shirt colors with the amounts of folds. To understand that the solver has to look at the previous "cicada" clue. Every T-shirt of the person was colored in these colors. The color order of the T-shirts was: green & black = 7743    blue = 2996   black = 666  brown = H366HT335  white = 28856  green = 25538. Searching this code on google showed a youtube video with the same title. This youtube video contains a robotic voice, the insignia picture of the mole and some strange noises. By checking the video with a spectogram some hidden symbols and a link were revealed. This file hoster contains an ASCII picture of the mole. "UNFORTUNATELY THIS IS AN UNSOLVED PUZZLE". After some time Nakano-Anapa made his second and last(so he claims) post. Hello, my moles. I am Nakano-Anapa. I haven't enough time left to explain it to you. I will need to go underground. This may be the last time you'll see a message of me. Remember ROBERT PARKER! Then accidentally a solver stumbled upon a reddit post by a user named "Robert-Parker". Do not worry, Nakano-Anapa is just on a little "vacation". Find the solution and add a .000webhostapp.com behind it. These coordinates belong to a forest in the state of Washington. Together with the date 1971, the coordinates location,and the keywords in the post, after some research the solvers found out that this is related to D.B.COOPER. D.B.Cooper was a man who hijacked and jumped out of a Boeing 727-100 at night in 1971 with 200.000 Dollars of ransom money after threatening the plane with a bomb in his case. The last webpage shows a sign and the words: "Someone already completed this. We contacted him. Wait for us 7/7/2019 -ZEOT" and also "Let our symbol guide you. Be aware of false leads." It translates to "Nakano Anapa Lives." No further information is known about the page.